I am trying to simplify meal preparation, but still make great (gourmet-type) meals. I don’t know why gourmet meals are important to me, but I think it is sort of my way of respecting Mother Earth and all her bounty. I try to make a lot from scratch and to use the freshest ingredients I can find. This meal is still a teensy bit complicated, but I am improving on my menu selection. As an added bonus, I made this recipe up. That’s right. This is a Lucy Original. And its not even from a contest or anything! I sort of lie about using fresh ingredients. Well not lie exactly. Partially to save money, and partially a deep-seated need to save the vegetables, I often buy the rotten produce that they mark down for quick sale. Actually, I don’t buy the rotten produce, just those that have been reduced, but are still good. I had a whole bunch of tomatoes, but canned diced tomatoes would work perfectly as well. I also stock-pile dented cans. Half price is half price. I am planning a series of recipes like this. I think very similar ingredients can be used and if you just change the herb/spice profile, you’ll have completely differing results. 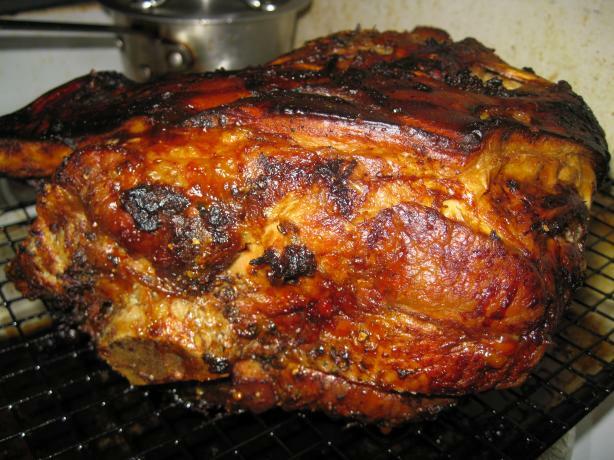 For this recipe, I used a Greek spice mix that I had previously made. That recipe follows. Any other spice mix, such as an Italian, will be just fine. 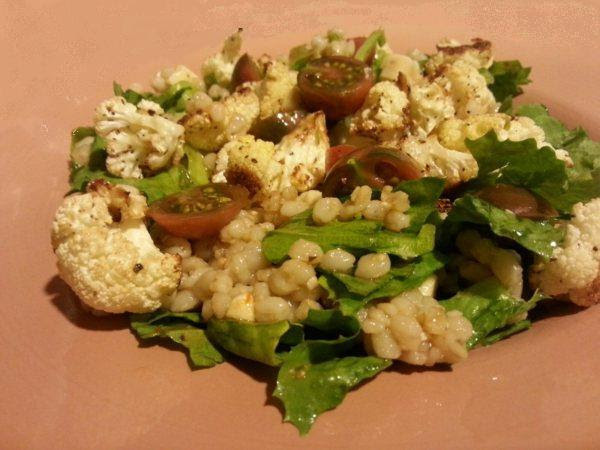 You can also use flavored diced tomatoes, such as garlic and herb or balsamic onion. Place tomatoes, in a single layer, in the bottom of a casserole. Season with the Greek seasoning. 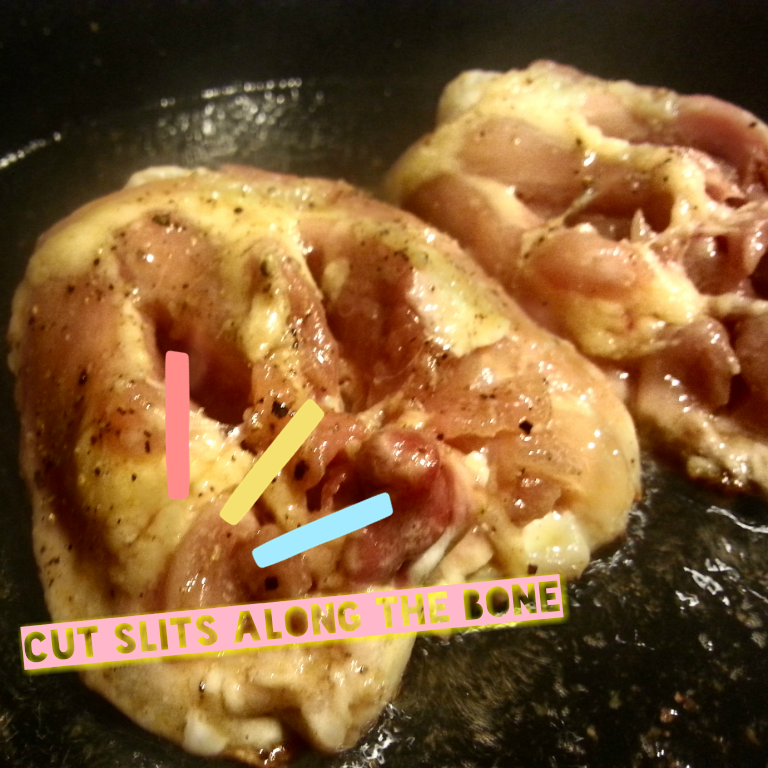 Cut slits, next to the bone, on the bottom of each chicken thigh. This is a trick I picked up from the great Jacques Pepin to enable the chicken to cook through without overcooking. Heat the oil in a skillet over medium high heat. 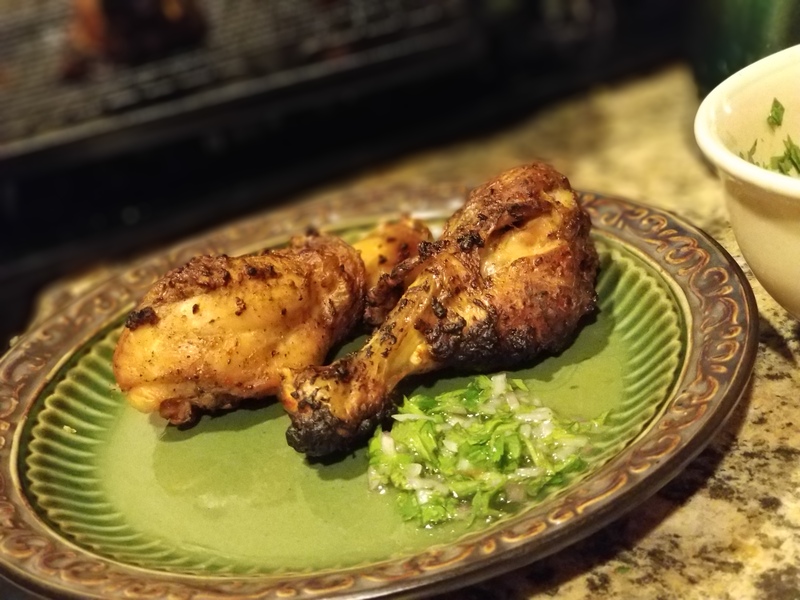 Season chicken well with salt and pepper. 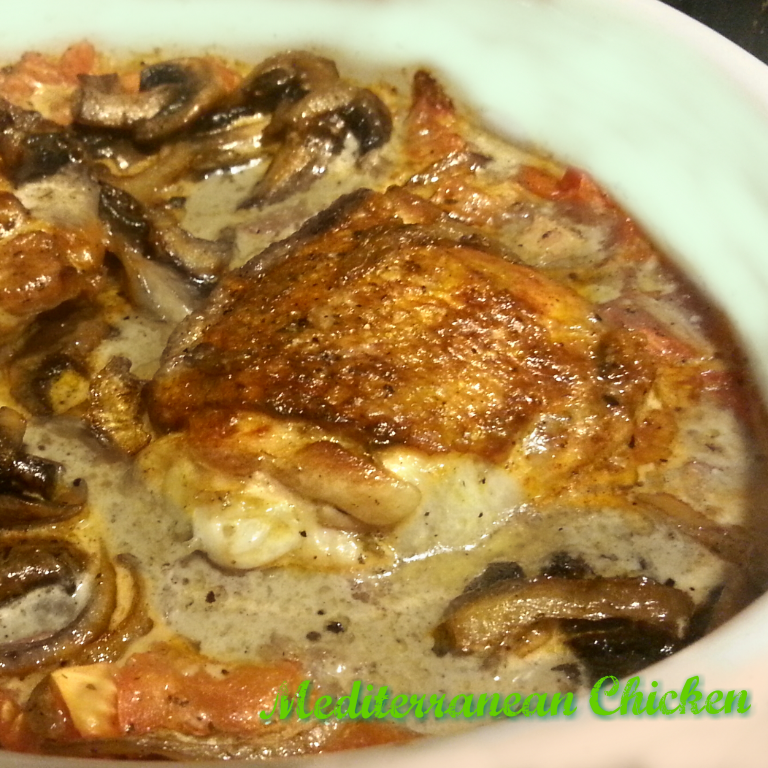 Brown chicken well on both sides, skin side first, then nestle them in the tomatoes you already placed in the casserole. Season with paprika, if desired, for coloring. Pour out excess grease from the skillet. Add mushrooms and cook, stirring occasionally, until they give up some liquid, about 5 minutes. Season with salt and pepper. Pour in the cream and cook while stirring for a couple of minutes just to incorporate. 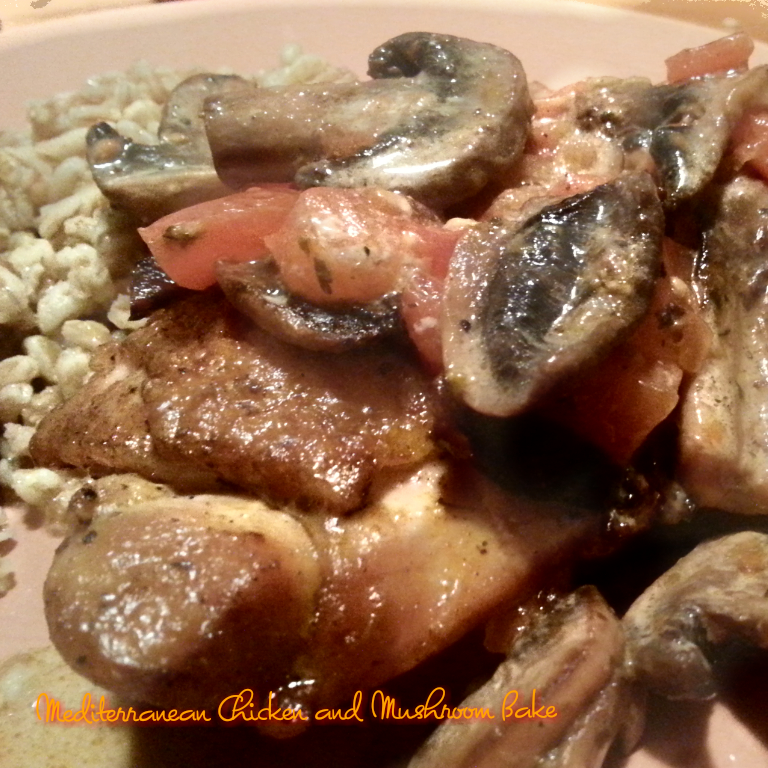 Pour mushroom sauce over chicken and tomatoes. Place in oven, uncovered, until chicken is cooked through and sauce is hot and bubbling, 30 minutes.